It's fair to say that Samsung hasn't quite managed to mirror the success of its Galaxy line of smartphones with its tablet siblings. Even though they share the same name, mostly similar design and even the familiar TouchWiz UI, they just haven't seemed to capture people's imagination as much as devices like the Samsung Galaxy S4 and the Samsung Galaxy Note 3. But, that hasn't stopped the Korean giants from constantly releasing new tabs into the wild, hoping to finally put up a slate worthy of competing with the likes of the iPad Air and the Sony Xperia Tablet Z. While both of those tablets boast 10-inch displays, the Samsung Galaxy Note Pro 12.2 packs a, you guessed it, 12.2-inch screen, giving it a nice little unique selling point over those illustrious rivals. But can the Samsung Galaxy Note Pro 12.2 dethrone the king and take the tablet crown? Read on to find out. At first glance, you'd be forgiven for thinking you were staring down at any number of Samsung's previous tablets. The curved sides, familiar home button flanked by a capacitive back and multitasking key and that slightly shiny bezel are are design traits Samsung has utilised on more than one occasion. Familiarity sticks around too when you look at the sides, which are covered in a metal-look, yet plastic rim that matches the Samsung Galaxy S4, Samsung Galaxy Note and Samsung Galaxy Note 10.1 (2014 edition). Turn the device over and Samsung's trademark leather-styled plastic, complete with fake stitching that covers the entirety of the back is present. It has quite a nice textured feel, making the whole tablet grippy and safe in the hand, but it picks up oily residue and scuff marks easily. We were constantly wiping down the back, ridding it of smudges. However, the marked improvement over the slimy, cheap plastic Samsung used to use on its devices is instantly appreciated. Even though we wish it would do away with the skeuomorphism on the stitching, it isn't quite as obvious as it was on the Samsung Galaxy Note 3. If you are contemplating making this 12-inch display toting machine your tablet of choice, you're probably already aware that it is rather on the large side. That screen stretches most of the way over the front, with bezels being kept to minimum, which is always nice, but just the obvious space needed to fit a 12.2 inches make it slightly unwieldy. Even though it weighs 750g, over 250g more than the iPad Air (469g) and Sony Xperia Tablet Z (495g) it doesn't actually feel that heavy, in fact it really does need the extra weight to make it usable, otherwise we can see it feeling to flimsy. Dimensions wise, the Samsung Galaxy Note Pro 12.2 comes in at 204 x 295.6 x 7.95mm, for a bit of comparison, the iPad Air measures 169 x 240 x 7.5mm. Due to the size, it's probably more suited to leaving at home and browsing the web/watching videos, or keeping in the office. That is unless you're looking to completely replace your laptop. It does feel a little more grown up than the Tab series, but there's still that lack of polish, a lack of finish that would put it on par with the iPad Air and the Sony Xperia Tablet Z. Samsung is slowly getting there, but there is still a lot more that needs to be done. Aside from the larger display, the other big talking point surrounding the Samsung Galaxy Note Pro 12.2 is the brand-new Magazine UX. Think a cross between the app Flipboard (which Magazine uses throughout) and Blinkfeed on the HTC One and that just about sums it up. This new UI has caused quite a stir since its announcement at CES 2014, with Google apparently not best pleased about quite how much change Samsung is putting into the Android OS. So, does the Magazine UX live up to the hype? In a word, no. Actually, we were a bit disappointed with the outcome. Acting as another home screen panel, Magazine can be accessed by a left swipe on the first screen or set to always be your default page, so whenever you hit the home button, you'll be taken straight to it. The first thing you'll notice is how much it resembles the tiled interface from Windows 8, from the square widgets to the block colours. There are a few different widgets to choose from, like email, YouTube and weather, along with some new sources and a few social networks, Twitter for example. You can fit a few different tiles on each screen, resizing them as to go. It does look quite pretty and choosing which bits you want to see is quick and intuitive, it's just the actual functionality that leaves a lot to be desired. First off, you're restricted to Samsung's own apps, so the email app isn't Gmail, but Samsung's version. The same goes with YouTube and Calendar, they're simply proprietary apps that can't be swapped in and out. This is annoying, as Samsung's own apps are no where near as strong or polished as Google's offerings, so it just puts you off using them altogether. You also can't add in your own news source or download any extra apps for more functionality; you're stuck with what Samsung gives you. Another headline feature of the slate is its multitasking capabilities and we have to say this is one area where it excels. Thanks to the 12.2-inch display, you can have up-to four apps open simultaneously. So, you could have Chrome open in one window, your email in another and the gallery in another - handy, eh? You can manually choose how much real estate each app takes up and thanks to the 3GB RAM, all this is smooth and pretty darn quick. It really improves productivity and brings the Samsung Galaxy Note Pro much more in line with laptops and Microsoft's Surface 2 and Surface Pro 2. Sadly, not all apps work in this mode, though all of Samsung's app do and most of Google's do. As this is a Note tablet, it comes packing the fantastic S-Pen, a Wacom-based stylus thatís incredibly useful and accurate. From jotting down notes in meetings, to doodling and annotating PDFs, we found ourselves instinctively reaching for the S-Pen every time we turned on the tab. It does feel a little bit flimsy, but not so much that we felt it was going to snap. Samsung's Galaxy Note Pro 12.2-inch comes running the latest version of Android, that's 4.4 Kit Kat, though it's still covered in the TouchWiz UI that is really starting to show its age. The colourful icons are child-like, menus are blocky and the notification tray is a complete mess - packed with far too many toggles and shortcuts to features we'll never use. Android, in its simplest, stock form is such a good-looking OS that it is such a shame Samsung just doesn't seem see this. You'll also find Bluetooth, a Micro-SD slot for memory expansion and a USB 3.0 port, for charging and data syncing. Clearly the headline feature, the 12.2-inch, TFT LCD display boasts a resolution of 2,560 x1,600 pixels and for the most part really impresses. As soon as you turn the tablet on for the first time and are met with Samsung's oil painting style wallpaper you'll notice the fantastic depth of colour that the tablet gives off. It's bright, vivid and punchy, with deep blacks and accurate reproduction of skin tones. Text is crisp and we have to say that this is one of the best ways to enjoy video, thanks to the large size it's just so much more immersive than a regular 10-inch tablet. Pixels are not completely invisible, get up close and they're easy to pick out, but really when you're looking from a regular distance the idea of pixels wonít cross your mind. It seems pretty clear that Samsung has designed the Galaxy Note Pro 12.2 to be used in landscape orientation, and only in landscape orientation. Turn it 90 degrees and it becomes almost useless. We tried reading a book like this and after about 30 seconds gave up and turned it round. As tablets grow larger, the need for a rear camera becomes even less obvious. There is no reason to take snaps with a 12.2-inch device; it's like replacing your compact cam with a laptop. But, Samsung has included one and it only seems fair to test it out. So here goes. The 8-meg snapper on the rear is, well, fine. It takes pictures that look good, with decent saturation and detail, but nothing more. There's an LED placed below the lens, but that puts an overly bright glare on the pics and it's best avoided. The front-facing 2MP camera is much more useful and it makes for nicely detailed Hangouts and Skype chats. While Apple likes to keep full details about the internals of new devices fairly secret, Samsung is quite the opposite, liking nothing more than spouting full lists about the vast array of powerful specs it packs into its devices. The Samsung Galaxy Note Pro 12.2 is no different. Nestled under that faux leather is an octa-core 1.9 GHz processor, paired with 3GB of RAM, 32GB of storage and a bevy of sensors. We've now got to the stage where tablets are packing specs that wouldn't look out of place on a laptop and that gives fantastic performance. Android 4.4 Kit Kat zips along, with smooth scrolling, fast load times and virtually no lag. Even Samsung's normally plodding TouchWiz UI performs well. Samsung says the battery lasts for 13 hours of regular use and that certainly fits with our experience. There's certainly plenty of room for a big battery in that chassis and the 9,500 mAh version here is plenty. In just the same way that 6-inch phablet smartphones are not going to be for everyone, 12.2-inch tablets are going to interest a very small amount of buyers. But, that doesn't mean there isn't a space in the already crowded tablet market for something a bit different. 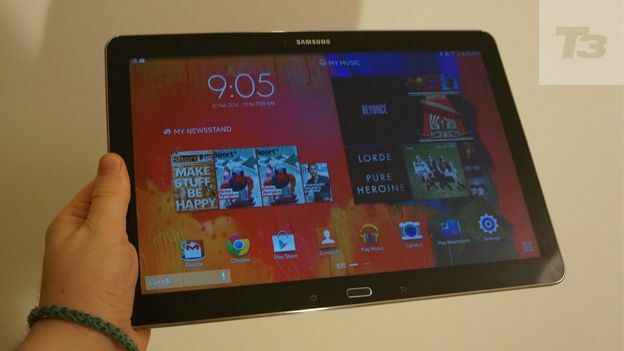 The Samsung Galaxy NotePRO 12.2 is a tablet that serves a purpose, and everything it does, it does with relative ease. It's super quick, stacked in the specs department and the display makes this the perfect device to gorge on a bit of Netflix on. It just seems that every time we review a Samsung device we're left with same complaints - the over bearing Samsung TouchWiz UI and the less than impressive build quality. While the materials used in the Galaxy NotePRO 12.2 are slightly more premium than we've seen on the Galaxy Tab lines of previous years, they still pale in comparison to the sleek, aluminium build of the iPad Air. There's one thing we haven't yet mentioned, and that's the price. This big tablet will set you back £649 for the 32GB model, that's around the same price as an iPad Air with 128GB storage, a 128GB iPad Mini Retina display with LTE or 2 Sony Xperia Tablet Zs. That's a whopping price, especially for a product that doesn't tick every box. At this price, we find it hard to recommend the Samsung Galaxy NotePRO 12.2, unless you really can't do without that extra couple of inches. While Samsung's tablet line is slowly improving, there is still much room for improvement, maybe one day the Korean giants will get it right. That day just isn't today.